All sensible people are environmentalists. We want to enjoy clean air, land, and water and we like to think that future generations will live in an even better environment. These were the original objectives of Earth Day and I am happy to have presented at Earth Day events in the early 1990s. Education is the foundation for progress. We need to build a global citizenry fluent in the concepts of climate change and aware of its unprecedented threat to our planet. Besides the strategic blunder of focusing so much attention on an issue that polls show the public do not particularly care about, there is a serious ethical problem that will come back to haunt Earth Day if they don’t soon change focus. Reports such as those of the Nongovernmental International Panel on Climate Change illustrate that debate rages in the scientific community about the causes and consequences of climate change. 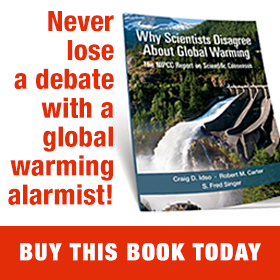 Scientists cannot even agree on whether warming or cooling lie ahead, let alone the degree to which we affect it. Yet, climate campaigners assert that ‘the science is settled.’ We know with certainty, they claim, that our carbon dioxide emissions will cause a planetary emergency unless we radically change our ways. The consequence of this overconfidence is tragic. According to the San Francisco-based Climate Policy Initiative, of the $1 billion spent worldwide each day on climate finance, 94% goes to mitigation, trying to control future climate. Only 6% of global climate finance is dedicated to helping vulnerable people cope with climate change today. In developing countries, even less, an abysmal 5%, goes to adaptation. Based on a theory about climate, we are letting people die today so as to possibly help people in the distant future. As the public come to understand how immature the science of climate change actually is, they will regard today’s funding situation as immoral and the focus of today’s Earth Day ridiculous. That scenario, not hypothetical future climate states, is what should most concern Earth Day organizers.